With Tile It showrooms in Phuket and Bangkok, our boutiques offer compact, unconfused displays, taking the "bazaar" out of tile showrooms and presenting you with an easy reference point for all your floor and wall solutions. Tile It stocks Italian porcelain tiles, and the highest quality European certified porcelain tiles from China: We offer a range of solutions to flooring requirements in pricing, whilst maintaining the same high standards of material performance and customer care. After sales services include the supply of accessories for installation, tile cutting machines, and care & maintenance. 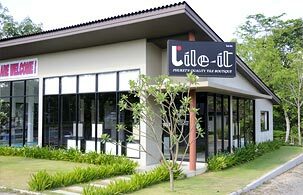 Phuket’s Tile It showroom is not difficult to find. It is located in an easily accessible area of Cherngtalay Sub-district, in Wana Park on Srisoonthorn Road, not more than 5 minutes from the Two Heroines Monument. Supply of wide range of high quality tiles for both indoor and outdoor spaces.